Waterloo, ON to Cornwall, PEI – If swearwords are all you know in the tongue of the country where you travel, do not be dismayed — you can at least say them to yourself. Today, without fanfare, I drove from Ontario into Quebec. As if to celebrate, the “MAINT REQ’D” light on my dash came on. Marde, I thought, proud that I knew one word in the local language. I was quite sure that the light meant was I needed to change my oil but pulled into a Toyota dealership outside of Montreal just to be sure. I vaguely remembered someone telling me that if I was pulled over for speeding, the police would take my car to Ottawa and I would have to find a way to pick it up. I worried that maybe it was the same in Quebec, perhaps with bigger consequences for breaking down, and wondered where they would take my car, leaving me on the side of the road. The real question was whether or not AAA covers picking me up on the side of the road. Right away, the receptionist at the Toyota dealership told me, “They go at noon today…on Friday, sorry” when I walked to the service desk. Besides knowing local swearwords, another travel tip is to wear a t-shirt with English on it to make it clear that French is “not spoken here”. I suppose you could wear a t-shirt with Spanish or German on it too. Just make sure you can speak that language that is on your shirt. I told the receptionist that a light was on on my dash but I thought it just meant I needed an oil change. She repeated that the service crew was not there and I said I didn’t think I needed a service person, just someone to tell me that light didn’t indicate something bad or dangerous. A fellow customer also standing at the desk caught wind of the maintenance light situation (and my lack of French skills). Enthusiastically she jumped in with her own oil tips. “You have no oil?” she said helpfully. “You need to check it. You can check it. You check the oil. You pull out the stick to check the oil….You check it?” She started making motions about how to check the oil-stick, in and out, in and out. Later I realized how lame No marde, Sherlock sounded and was glad I only replied with motions twisting my hand to show how to change the oil, insisting that that’s all I thought I needed. Finally a salesman watching the charade walked up and understood what I was asking. Something about the French quebecois in their own province is slightly intimidating when you’re road-ragged and disheveled from driving, greeted by a slick salesman in a suit. Relief! With someone to slightly understand me, I decided to push him for a little more information. I set my Canada gazetteer mapbook on the counter and said, “Great, can you tell me where I am?” He looked stunned. I’m pretty sure I knew mostly where I was but the highway had turned into what felt like an arterial road with stoplights and didn’t seem highway-ish like I’d thought. Plus there are rivers in Montreal that are not on the map so counting bodies of water – something I’ve tried to keep track of where I am – wasn’t working. “You…” he said smiling. “Are here.” And he drew a circle. Marde, I thought! Wasn’t I on the other side of Montreal? The salesman looked at me and smiled. I also told him merci. I’d strongly recommend learning the local way to say “thank you” wherever you’re traveling as well. I hoped for the opportunity to actually say marde in the future but within the province, Quebec is proper and one doesn’t seem to say these words. After sleeping through a rainstorm in my car in the Quebec City’s KOA campground, I hit the road and drove through the foggy Quebec countryside. Supposedly, Ontario is known for their agricultural variety, Quebec for more of the big farm produce like wheat. The folks I actually met in Quebec were very reserved and clean. The KOA even had mops in the immaculate washrooms so you could sponge out your shower stall afterward. Everyone, even teens, wipes their feet when the walk into a building. Driving south into New Brunswick, I pulled over for a nap in Woodstock and learned that in northern New Brunswick, the people speak French. I’m not sure what I ordered in my coffee but it tasted good. I was hoping to see a moose, what with all the warning signs, but had no luck. The next big city on the map was Moncton. I’d also recommend listening to the radio before you pull into a city so you know how to pronounce its name. Moncton is pronounced, “MUNK-tin” and once again, I accidentally took a wrong turn and ended up in the industrial area. Luckily, again, I found a Toyota dealership. He pulled out a pen and marked various spots to visit…Alma on the Bay of Fundy where the tides are notorious for their raging ebb and flow, then Victoria on Prince Edward Island which has a great coffee shop, and some raving about Cape Breton if I wanted to hear music. Halifax, he told me, was generally a great city too – good to hear since I’d heard about a homicide investigation underway in the downtown area. The salesman even told me I could throw up a tent at his cottage if I wanted, just on this side of Prince Edward Island. With his direction, I headed out of Moncton and drove north through what felt like the Olympic Peninsula with shaker houses. People on four-wheelers crossed the highway heading into forests. 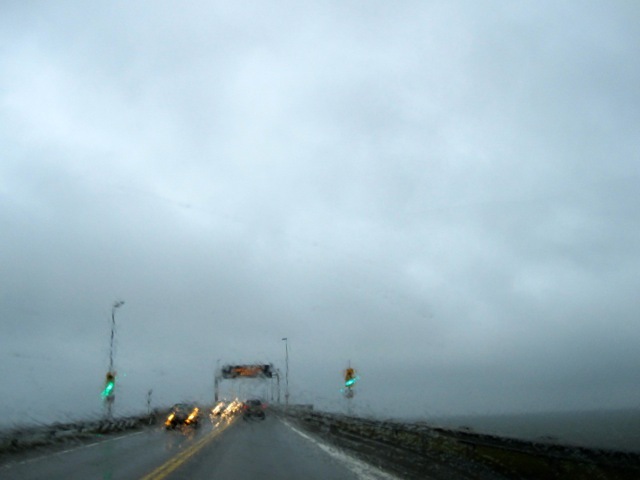 The Confederation Bridge is an experience, spanning the Abegweit Passage of Northumberland Strait between New Brunswick and Prince Edward Island. It takes 15 minutes to cross and you can see the Atlantic Ocean, white-capped, on both sides. The campground was packed and the bathrooms were quite dirty but I threw up the tent in my site. Then I realized that it didn’t have electricity like I paid for earlier. I learned a quick lesson about the personality of the island when I went to ask for another site. If there’s a problem, you go out to look at it instead of discussing the details, and you go out to look at it slowly. We drove in his golf cart all the way back to the site where he said, “Hmm, yeah. That’s not going to work.” He walked around the other trailers, the other sites, and took in their various electrical hook-ups before walking back around my site. Nothing is rushed on PEI even though it was getting dark. We drove all the way back to the office to change sites – everyone made sure to make the littlest deal about as possible. Confrontation is avoided at all costs, it seems. I thanked him for his help and said again that the island was beautiful but this was way too friendly for him. I got the typical nod and “Okay then.” I’m not sure how they handled the New Yorkers who arrived as I was exiting the office. Later that night after a splendid local beer and flatbread at the BrickHouse, a pub in downtown Charlottetown (pronounced Charl-ton). Here, the bartender actually had lived in Tofino, BC — why? Because I’d never lived there! We swapped stories about the west coast. Later, I drove into the KOA. The same maintenance man stopped me at the little guardhouse. “It’s me! I found a great place for a local beer!” I told him. He smiled, nodded and simply said, “You have a good night.” Maybe he’s just shy. So did you change that oil?? Yes, but it took a few more provinces…stay tuned!